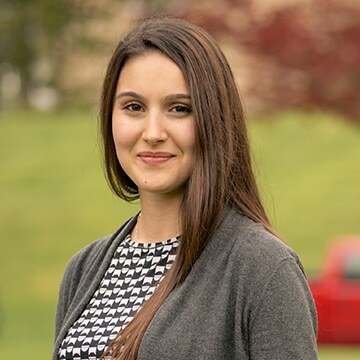 Alexandra graduated from Hellenic College in May 2017 with a bachelor’s degree in Management and Leadership—and the promise of a wonderful future that she could never have dreamed of as a child. Born in Romania, she moved to Greece with her family when she was four years old. When she was 12, her mother gave birth to a son so premature that he was not expected to survive. Miraculously, he did, but with serious health issues that required long stays at Children’s Hospital in Boston every year. Last year, Dr. Lazaridou asked Alexandra if she would like to be her intern. That unpaid internship led to a part-time paid position, three full days a week, which Alexandra held while carrying a full load of classes and serving as a student representative to the faculty. To her amazement, a paper based on the pain study appeared in a major medical journal with her name on it as a co-author—and the offer of a full-time job as Clinical Research Coordinator starting right after graduation.